What is Innova Health Konjac Glucomannan? Konjac Glucomannan is a plant of the genus Amorphophallus. It is called Konjac Glucomannan , Konjac flour or Konjac gum. Konjac is used in traditional Chinese medicine for more than 2000 years. The flour belongs to the family of soluble fibers such as oat bran. This makes it a very absorbing food that lowers cholesterol and facilitates intestinal passage. It is a native plant from eastern Asia. It is a pure soluble fibre, with almost no fat, no sugar, no starch; it is gluten free and wheat free. It is a perfect substitute in cooking and baking when flour and other sticky starches needs to be avoided. It's a powder made from the Konjac plant, a type of yam. Konjac Glucomannan is extracted from the root of the Konjac plant. it absorbs the flavours of other ingredients you add. Pregnant or lactating women, diabetics, hypoglycaemic, and people with medical conditions and/or taking drugs, should consult with a licensed physician and/or pharmacist prior to taking dietary supplements. The flour should be taken in a mixture with liquids. We do NOT accept any responsibility for any problems incurred from any adverse reactions/allergies. We make no therapeutic claims regarding the use of our products. Konjac offers multiple health benefits. Studies show that supplementing with Konjac Glucomannan enhances the weight-loss effects of a calorie-restricted diet. It has a naturally unique physical effect on the body that allows the powder to expand up to 80 times upon digestion. This effect will allow you to feel full faster. Konjac root fiber can help you maintain a healthy weight level. Konjac flour is able to fight obesity, because the Konjac flour contains 0 calories compared to ordinary starches and foods. Swells in the stomach after being consumed creating a sense of fullness. This product assists with everyday digestive movements which are beneficial and necessary for our health. Health benefit research indicates that soluble fibres such as Glucomannan may help lower blood cholesterol; slow glucose absorption lowers the Glycemic index and promotes regular bowel movements. Can help to clear a deposition of fat and cholesterol in the cardiovascular region. 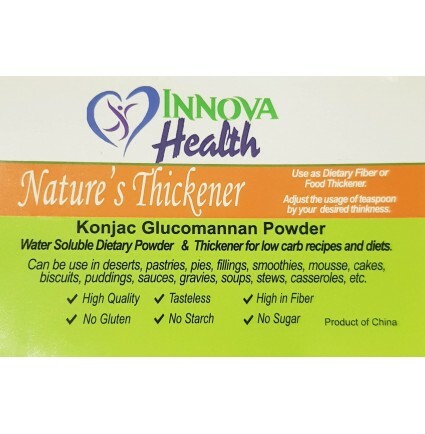 By creating a thick gel, Konjac Glucomannan delays gastric emptying and slows the release of sugar into the bloodstream. It is proven to lower blood sugar, lower blood pressure, detoxify, promote beauty, and alleviate constipation and other gastrointestinal effects. Improves blood-lipid profiles and can lower systolic blood pressure. Contains soluble dietary fibre, this specific type of fibre is a very effective inhibition of postprandial hyperglycaemia, making Konjac flour and its products ideal for patients with diabetes as it is a hypoglycaemic food. Konjac has no side effects; Konjac can be the best weight loss natural product for many consumers. The Konjac powder is safe to use with any diet, is 100% natural, with anti-cancer and hypoglycaemic effects. Some shakes sachets contains Konjac Glucomannan which combining with other ingredients will increase fat burning, provide higher energy levels and accelerate weight loss results . Because Konjac Glucomannan is fiber, is bulk, this bulk fills up our stomachs making us feel full. This is just one in a long list of reasons for the weight loss. Can you use Konjac flour in place of starch type thickener like cornstarch or all-purpose flour? Konjac flour has the much stronger "thickening power" than potato starch and cornstarch. Konjac flour has about ten times the "thickening power" of cornstarch. It is a great substitute for corn flour and any starch with only few calories. When it’s mixed with liquid it creates a thick rich creamy texture with just a small amount. It doesn't have a taste of its own; it absorbs the flavours of other ingredients you add. It has a brighter, more translucent appearance than those thickened with all-purpose flour. It has ten times stronger thickening potency than corn-starch. It has added health benefits. It’s naturally low fat, high in fibre. 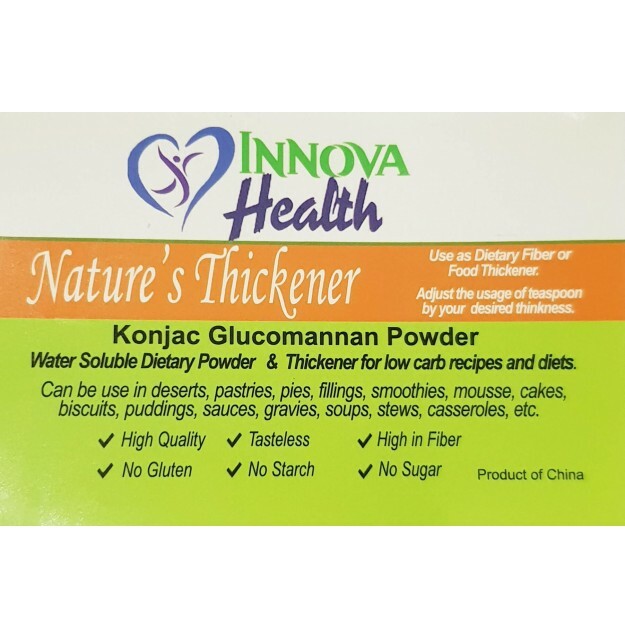 Konjac can be used as a healthy thickener as it is a completely natural alternative without any artificial ingredients or preservatives. Anyone can use Konjac whether you are a health foods fan or are just interested in konjac. Combine 1 cup water and the chicken stock cube and set aside. Combine 1/2 cup water, Konjac flour, soy sauce and pepper and set aside. Sauté onions in oil over medium high heat until translucent. Add remaining vegetables and sauté for 1 minute. Stir in stock mixture. Add Konjac flour mixture stirring constantly until translucent. Add cooked chicken. Heat thoroughly and serve over rice. Combine 1 cup water and Armour chicken bouillon cube and set aside. Combine 1/2 cup cold water, Konjac flour, soy sauce, cider vinegar, orange juice, and white pepper and set aside. Saute onion in oil over medium high heat until translucent. Add remaining vegetables and saute for 1 minute. Stir in bouillon mixture. Add Konjac flour mixture, stirring constantly until translucent. Add cooked pork, pineapple chunks and almonds, and heat thoroughly. Garnish with mandarin oranges. Serve over steamed rice. Boil chicken together with crushed ginger and raw garlic till tender then remove it and set aside to drain. Dice the meat. Return the soup on stove and when it boils add in the diced meat together with Soya bean sauce, pepper and salt. Dissolve Konjac flour with cold water and add to soup. Beat eggs thoroughly and add to boiling soup. Boil bean sprouts. Drain water and set aside. Cut the celery into small pieces and add into the dish. Roast the fish paste and mix with thoroughly pounded green pepper and juice of lemon and the relish is ready to be served with the noodles and Konjac flour soup. Serve noodles in a medium sized bowl. Pour soup over noodles and garnish with bean sprouts and celery. Mix in relish to taste. Crash 3 tomatoes in a pan. Mix in a very small bowl, 2 tsps of Konjac flour with cold water, just enough water to make it look like thick milk. Add a little at a time to the tomatoes, while tomato mixture is keeping hot, in a low flame, the mixture should thicken, if not add a little more until you see the thickness you like. Combine 1 cup water, chicken cube and margarine or butter and microwave on high for 2 minutes. In a separate bowl, combine 1/3 cup cold water and Konjac flour and mix well. Add Konjac flour mixture to hot mixture and return to microwave. Quick heat on high until slightly thickened. Stir until well mixed. Blend in Konjac flour and add salt and pepper. For soups add 1 1/2 cups chopped, cooked vegetables to 2 cups sauce. NOTE: Start out with just the 5 tsp Glucomanna, but depending on the size of the eggs you may need a bit more. Mix together wet and dry and microwave for about a minute. There may be a little moist stuff on top--don't microwave until entirely dry. Dissolve in 300ml of water the konjac, in a pot, put the konjac, strawberries and liquid sweetener or stevia, and bring to gentle boil, move the mix for , about 25 minutes and remove from the stove. In hot water dissolve Aeroplane jelly lite and add to the pot mixing well. Let the mix cool and pore the content into containers.